Hands down, my favorite teacher was my Paternal Grandma. I have never had a better biscuit, than those that came from her hands. Her biscuits were magical. As a young girl, I was only interested in the transfer of the warm biscuit from her loving hands into my eager ones. As a young woman, I paid more attention and tried to duplicate her techniques. She did not measure everything precisely and she did not flour the counter and roll the dough and cut it. She did it all by feel. I was awed by how the dry ingredients were dumped into a mixing bowl and the wet ingredients were added after she made a dry well in the center. She would shape the dough into biscuits with her hands. She did this every morning and in no time at all, hot biscuits were on the table, with golden, beautiful crusts and no big mess to clean up either. I am sad to say I was not a very good student in biscuit making. I know that you can ruin the finished product if you handle the dough too much. I miss my Grandma and her biscuits. 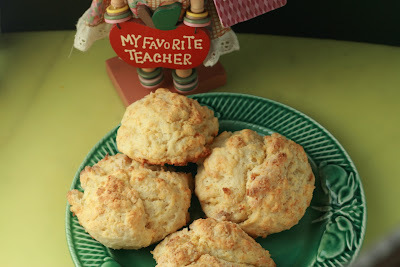 Who is your favorite teacher in the kitchen? I would love to know, along with what you learned. 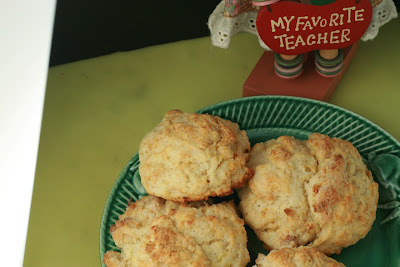 As for biscuits today, I have a second favorite teacher and that is the crew over at America's Test Kitchen. They have perfected Drop Biscuits and I saw a demo yesterday, that made me sit up and take notes, and even happier this morning, when I duplicated it and served the light soft pillows with a golden brown exterior. 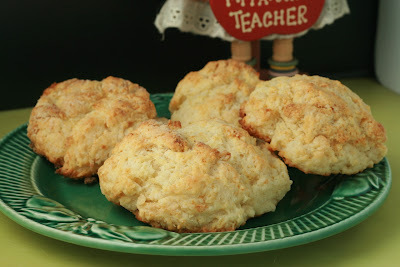 Still not my Grandma's biscuit, but a very good, easy one to make and no messy kitchen. If buttermilk isn't available, powdered buttermilk added according to package instructions or clabbered milk can be used instead. To make clabbered milk, mix 1 cup milk with 1 tablespoon lemon juice and let stand 10 minutes. A 1/4-cup (#16) portion scoop can be used to portion the batter. To refresh day-old biscuits, heat them in a 300-degree oven for 10 minutes. 1. Adjust oven rack to middle position and heat oven to 475 degrees. Whisk flour, baking powder, baking soda, sugar, and salt in large bowl. Combine buttermilk and 8 tablespoons melted butter in medium bowl, stirring until butter forms small clumps. When you stir slightly cooled melted butter into cold buttermilk, the butter will clump. Although this might look like a mistake, it's one of the secrets to this recipe. The clumps of butter are similar to the small bits of cold butter in biscuits prepared according to the traditional method and help guarantee a light and fluffy interior. A greased 1/4-cup measure is a great tool for scooping dough onto a parchment-lined baking sheet. I am going to have to try this recipe this weekend. Love biscuits, just cant always make them from scratch! I have enjoyed getting to know you, go to my blog and pick up your award. It goes to 5 blogs I have found extra special! I love the way you write about your grandmother. I've learned a few things from both my maternal and paternal grandmothers and still use recipes from both of them today. I love that kind of legacy! !